Welcome to The Petite Plate! My love for cooking started from watching my mom make family dinners every night, seeing people react to my Grandma’s famous caramel cake, and gorging myself on the fresh picked fruits and veggies my Kookie (grandfather) always had at his house. My goal is to bring the same love, warmth, and deliciousness to your table! These are the perfect pickle for snacking, adding to a salad, or to garnish a Bloody Mary with! The first time I made these was for the girls in my book club and they nearly disappeared before I could try them myself! 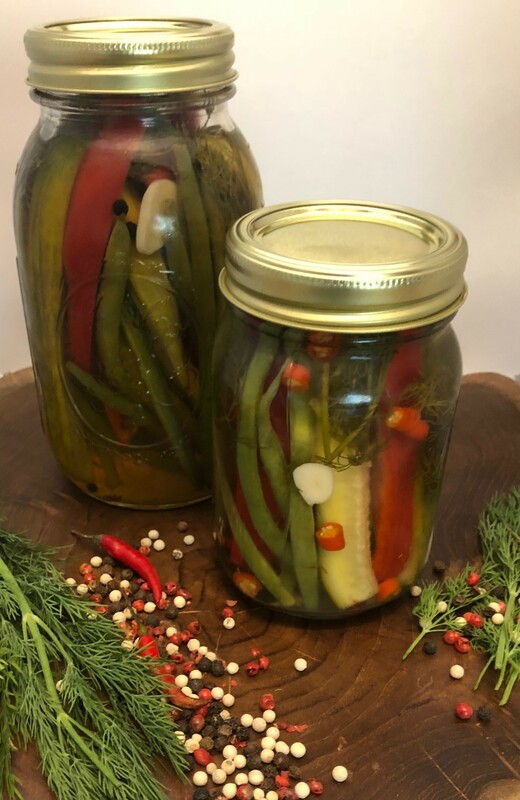 This is an easy recipe to tweak if you like your pickles a little sweeter or a little spicier than I do (they will get spicier the longer they marinate!). I use okra, cucumbers, and french green beans because they’re my favorite, but any veggies would be great. Try this recipe with carrots, cauliflower, or peppers and let me know what you think! They’re easy, they’re delicious, and they’re impressive so give these freaking frickles a try already! Crunchy and Sweet Pickles with a Kick! Perfect for snacking or dressing up your Bloody Mary! 15(ish) Okras – depending on size! Add Vinegar, Salt, Peppercorns, and Sugar. Stir until the salt and sugar have dissolved. Bring mixture back to a boil. Turn down the heat and and let simmer covered for 5 to 10 minutes. Assemble your veggies in your jars (I used two 1 quart mason jars). Don’t pack too tightly, you need room for the brine and seasonings! Add garlic slices, Thai Chilis, and Fresh Dill to each jar. Pour Brine over the veggies and cover with air-tight lid. The pickles will be ready to eat in 2-3 days and will keep for about 4-6 weeks in the fridge! Enjoy!